On Sunday mornings, random visions of features I'd like to write fly though my brain, usually while I'm relaxing and trying to tune out my to-do list. I seldom write up those ideas. Today, I'm going to collect my random thoughts into one feature. I'll bounce around, exactly as my free-associating brain does. This is not about politics. Please do not respond with a political comment. This is about fashion and presence. After the convention in Charlotte, I had to decide (yes, I forced myself) whose dress I preferred. Michelle Obama's or Ann Romney's? Given my innate ability to select the most expensive option available, even when I'm not presented with prices, you would think I would have chosen the Oscar de la Renta. I overlook the fact that Romney's dress was priced at roughly $2,000 and Obama's dress, designed by Tracy Reese, will likely cost less than $500. I'll take the stunner Michelle Obama wore any day. There's nothing wrong with a classic shirtwaist, and the red was picture perfect for a "red-themed convention," even if it was a little boring. The moment I saw Obama's ornamental pink and blue-grey dress, though, I gasped. I'd make room for it in my closet any day. That dress was gorgeous. I'll bet it sells out before it hits the stores - and it will hit the stores. That's my kind of party dress! There was a little speculation (among insiders) that Michelle Obama was wearing a Le Métier de Beauté nail lacquer. It was reported, however, that it was Vogue by Artistic Nail Design. It matched the blue-grey of the hem of her dress beautifully. Her lipstick was also a perfect choice. Wonder what it was. Bergdorf Goodman is celebrating its 111th anniversary. Their Fall Book, 111 Years of Extraordinary, is a fashion page-turner. Now, you can turn the pages online. Check it out. 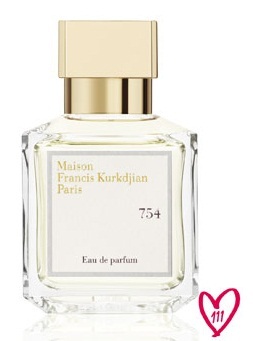 Among the special items created for Bergdorf's special year is Francis Kurkdjian's new eau de parfum, "754" ($300), named after the store's address. I received mine this week, and it's glorious. Created exclusively for Bergdorf Goodman by Maison Francis Kurkdjian. "754" custom fragrance, was created to capture the allure and vitality of New York City. Masterfully blended with notes of citrus, florals, and musk, this sensual and fresh unisex eau de parfum is an olfactory evocation of a bright blue Manhattan morning. I'm looking forward to wearing it to work this week. Beauty Week at Neiman Marcus has left me a little crazed - and broke. I had a blast seeing friends, like Erin Lockard, who left Neiman Marcus yesterday on a train bound for Fashion Week in New York. Here's Erin, looking gorgeous as always, pictured with Chanel's beautiful Lizette Settepani. It took me two days to get this photo. I started (or attempted to) at Neiman Marcus Mazza Gallerie on Friday when my camera reminded me the battery had no juice left. I was lucky. They were both at Tysons Galleria on Saturday, and we were able to grab a moment for a re-do. Lizette was able to find me a Long Wear Luminious Eye Shadow in Apparition. I'll show it to you later today. Look at this beautiful photo I received from Essie showing the Essie Look at the Helmut Lang Spring/Summer 2013 fashion show. Click to enlarge it and enjoy! That's it for This and That for now. Hope you enjoyed a few of my random thoughts for the week. So between the 2 women shown in your photo, which is which? You just cannot beat Michelle Obama. Just looking at her and you know she'd be a wonderful friend. The two women project entirely different images and are at dramatically different places on their life path so it would stand to reason that their dress choices would reflect that. So, which dress did I prefer? Neither. I thought Michelle's dress looked better suited to a BBQ than a national convention. She did look strong, healthy, and confident, though--but then, doesn't she always? Ann's dress was just plain boring. Red is an exciting, commanding color. If you're going to wear it, don't go for frumpy. I can imagine some political stylist saying, "We need something plain and conservative. You know, like the housewives used to wear back in the day. Oh! And red! Make it red!" I'm sure they would both be nice friends. You made me laugh. Plain, conservative, boring. Yep. You said it. It was, though, de la Renta, and I liked the full-skirt flair. I have a gorgeous and very old British racing green shirtwaist. I wish it had a full skirt. Obama's dress had gold threads woven through the fabric, so I wouldn't wear it to a BBQ party. It was snazzy in person, I hear. In fact, some handlers worried the gold would radiate too much on TV. It didn't. Ann Romney may have made a political statement with her dress. I don't know. I doubt Michelle Obama did. I'm glad, though, she wore an African-American designer. she always looks good. Nothing against Romney she looked pretty. Essie is tops, nothing else compares to it :-) At least in my books. I think you misunderstood my original comment; I was asking which was which of the NM women in your pic, not the pics of Michelle and Romney. You made me chuckle, my version of a scent for a Manhattan morning involves the smell of the NYC subway which is rather unpleasant at best. But I'm being silly. Both ladies looked nice in their dresses, I wouldn't have picked them for myself but for them, perfect. LOL, Nemo. I sure did. Erin is the tall one. Michelle Obama's dress is gorgeous! Nice touch to not do a pink nail polish. I have an Essie color I purchased recently. I must show it. Totally gorgeous. I thought it was interesting that Michelle's dress looked much more expensive than it turned out to be and Ann's dress looked much less expensive than it turned out to be! If you had a big enough or clear enough TV screen, you could see that Michelle's dress was a very luxurious, richly textured almost brocade-like fabric with much depth and metallic threads. Definitely not bbq - more like a wedding! Ann's dress was lovely but safe, although her makeup looked very vibrant. I know that Michelle is noted for her toned arms and shoulders - she frequently wears cut in shoulders. But, the dress would have been much more lovely with a small cap sleeve. I thought the shoulders were cut in way too far, was too tank top looking for the occasion, and for the loveliness of the dresses material. Well, I'm not toned or particularly fit these days (with my back probs). However, I would wear that dress. I think it would be flattering - even to me. Some would like cap sleeves, which can be nice. Good idea. I don't look all that good in them for some reason. I prefer sleeves that go to just above my elbow. Why? I get self-conscious in caps. There's something about them that makes my arms look like toothpicks. Maybe that's because they are. :) They were thin even in my swimming days. Heck, I'd prefer long sleeves, but I realize they don't go with that design and would have looked dorky. BBQs in my area are super-casual. I guess they dress better in SoCal. All, I meant it when I asked for no political comments. We got an anonymous one that was semi-political, and I deleted it. I'm sorry. I think it crossed the political line with the exhortation to vote. I think my readers are smart enough to know that there's no relationship to politics - or voting - when we discuss dresses. You are a well-educated and aware group. Who knows? I might contrast the presidential candidates' apparel sometime if I get a wild hare. Sunday This and That was intended to be fun or informative. Not a platform for politics, even remote politics. This was such a fun Sunday ramble. I've enjoyed the comments. And, since my "neither" was not an acceptable answer, I'll choose Michelle's and wear it to a BBQ/dinner party. I guess in my neck of the woods, evening BBQ's are a bit fancier. :-) By the way, I bet your BRG (love that color!) shirtwaist is gorgeous. That's the perfect color for that style of dress.